Coach Mark Scott and the special olympians pose with their medals. The country’s Special Olympics outfit found success once again at the event which concluded on Thursday in Abu Dhabi, United Arab Emirates. The games which commenced on March 15, saw Guyana capturing five medals – three silver and two bronze – one individual and the other team. 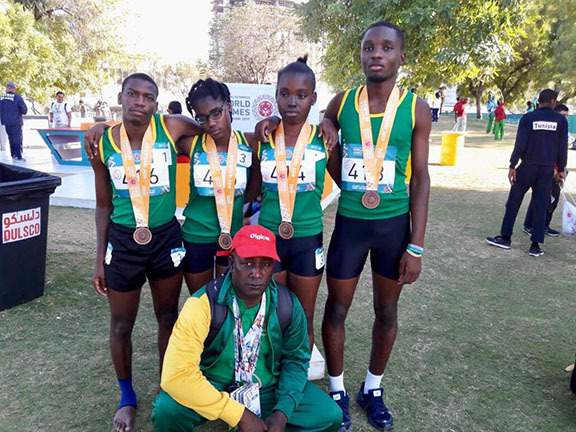 Calvin Thomas took bronze in the 5000 metres while Abdullah Braithwaite got silver in the 400 metres, Faith King and Dacia George won bronze in separate 400 metre events. The team also earned a bronze in the 4 X 400 metre event. Head of the delegation, Wilton Spencer, said he was content with the level of the team’s success. They departed yesterday for home. The team’s sojourn was made possible by major sponsor Digicel, President David Granger and the Guyana Olympic Associations among others. The special athletes were trained and coached by Mark Scott.